This project is a classic. Loved by beginners and seasoned crocheters alike, this swath of crocheted fabric is used over and over again. It is loved and appreciated. It offers comfort and cleanliness. It gives us a chance to test our skills. It helps our gauge swatches find life in various rooms in the home. The most elegant, essential crochet project ever? It’s the crocheted washcloth. I don’t know if you’ve ever thought of a washcloth this way, but bear with me for a moment, because I think I have a pretty good case. A washcloth is nothing more than a scrap of fabric. While sizes and shapes may vary, a 7- or 8-inch square or square is probably an average size. A washcloth is elegant in the technical sense, meaning it is “gracefully concise and simple” in form. Some (but not all) are elegant in the traditional sense, and bring luxurious design to a gift or to a space where they’re stored. 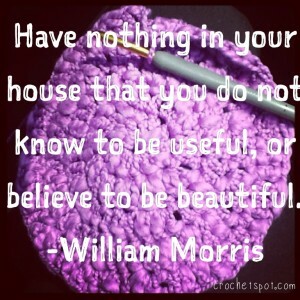 These objects are essential to crochet because they capture the essence of our craft: beautiful & useful. As mentioned, the elegance of the washcloth begins with its simplicity. Working from the most basic shape, a square or circle, the washcloth offers us limitless possibilities. Choosing the perfect yarn for absorbency, beauty, buoyancy, feeling, and strength elevate the project. Stitch pattern choices create a fabric with specific characteristics, like maximum scrub-ability and boosted bubble-creation. 😀 Selecting a hook that will form a fabric of the proper density will create a sturdy but supple finished object. As a rule, washcloths are pretty small and quick projects, making them the perfect item to carry along with you on your commute or to work on during a break at work. This characteristic further supports the essence of washcloth crochet. As with many types of crochet, it’s quick and portable! While washcloth projects could certainly be mindless, repetitive crochet, we could use washcloths with new or complex stitch patterns to expand our skill sets and learn new techniques. Both types of project have value and a place in our crochet repertoire. Here are a ton of great washcloth patterns found right here on Crochet Spot! So what do you think about all of this? Do you ever crochet washcloths? What is your favorite pattern? Do you think washcloths are the most elegant, essential crochet project ever? Why/why not? Please leave your thoughts and ideas in the comment below! This entry was posted on Tuesday, July 22nd, 2014 at 12:00 AM by Caissa "Cami" McClinton	and is filed under Fun Ramblings. You can follow any responses to this entry through the RSS 2.0 feed. You can skip to the end and leave a response. Pinging is currently not allowed. Dishcloths are an essential in our house. I just had to find a scrubbie pattern for one that was sent to me in a swap. DH has fallen in love with it and wants more. Most patterns are to open or loose or stretch out when wet to be very practical. My family loves getting washcloths/dishcloths. I belong to dishcloths_n_more_love_feast a yahoo group and we get 2 crochet patterns and 2 knit patterns a month – so always have them on the go. Also belong to monthly dishcloths another yahoo group but that is knitting not crocheting. My sister and one of my d-i-l love hexagon shaped dishcloths so I do a lot of them. I just follow the pattern at the lionbrand site. I also make scrubbies, I get my nylon netting from Knits & Bits, they have a page on facebook called scrubbie makers. I agree that washclothes/dishclothes are essential, especially since the are a great way to try out new patterns before making the whole blanket, scarf or sweater. Kitchen towels are also a must. I have found, through much experimentation, that acrylic yarn works best for dish cloths and wash cloths … also soap holders … because they don’t over-absorb soap and are scratchy enough to really scrub, whether it’s dishes, greasy pans or exfoliation. Cotton works best for towels because the more you wash it the softer it gets. When I do dish clothes I always add a loop to the corner so that it can be hung on the faucet. I find that acrylic makes the best dishcloths as well. They get rid of grease on plastics (and everything I have is mostly plastic, since I have a little boy) better that anything you can buy. It’s a great way to get rid of scrap yarn and you can simply toss them in the washing machine and they’ll last forever. And if they don’t, I don’t feel bad about throwing them away because they cost pennies to make. I usually make mine doubled in a Tunisian crochet for structure, just seam the short ends and you also don’t have to worry about the curl. Nothing cleans grease better than acrylic, imo. Please, how do you ‘seam’ the short ends? I am not sure what that means. I have been making a square with the Tunisian and then single crocheting a border to stop the curling. I was so glad to read your comments also. I had been disappointed with my cotton dish cloths which is why I only made cloths that I planned to use in the shower. When you say doubled in Tunisian crochet, it means ?? I have made several washcloths. Some were made of Lily Sugar and Cream cotton; (I did not think acrylic yarns would be as absorbent as cotton) but mostly I used Hobby Lobby’s ‘I Love this Cotton’ yarn because they were for babies and this yarn is so much softer. I have mostly used the basic Tunisian style of crochet because it makes for a tighter fabric. I also have never tried using acrylic yarns because I assumed they would be ‘itchy’ to my skin than cotton yarns. I did try to use acrylic for a washcloth and found it too scratchy for my skin. Much prefer cotton for washcloths. I also find in my experience that a cloth for dishes made too in too tight a stitch will not ‘fit’ down into mugs or glasses. So I have a mesh dishcloth pattern that I use that is loose enough to fit into tall latte mugs and coffee cups and glasses and yet is still big enough and flexible enough to wash just about anything. As for using acrylic for dishcloths I would be concerned that they don’t come completely clean in the wash from food. The cotton I use does. Better to just use a scrubbie in acrylic for such purposes. Just my opinion. I mean to use a nylon scrubbie not an acrylic scrubbie to come clean easier in the wash.
Just like granny squares, I have fallen in love with crocheting washcloths….so much so, I just ordered 15 different skeins of cotton yarn just to make them….As a beginner with this I don’t have a favorite pattern, but always looking for different patterns to make….I am definitely going to check out those links above and as soon as my yarn arrives, I will crochet those I can follow the pattern for and then come back here and post them…. Thanks Rachel, you always seem to know what I need at the time I need them…. Like to crochet dishcloths (as we call them) using cotton for better absorbancy. Great for practicing different stitches and patterns and as a take along to work on waiting for appointments, etc. Always keep a kit in the car of cotton yarn, hook and pattern in case I am stuck in traffic. It is also a good diversion when working on large projects such as afghans or complicated scarf patterns. Always have on hand to give as gifts along with potholders and coffee cup holders. I wondered at first why people say they got addicted to making dishcloths/washcloths, but once I made a couple I realized how fast and easy they could be, or how they make great practice on a new technique or stitch before starting a project in an expensive yarn. I prefer cotton for absorbency, but I’ve also made a few in acrylic for scrubbing; they didn’t last as long as the cotton though, so I’ve since stuck with commercial scrub pads. But I’ve seen cute ideas for adding edgings to retail scrubbies to look like flowers; I may try those. I think dishcloths are great gifts because I’ve been asked for them more than once! Colorful or plain, people seem to really apreciate crocheted washcloths. I love making dish/washcloths. In our house, any cloth that is mainly green is used for dishes. The other colours are used as facecloths. That way hubby knows which cloth to grab! I also make them up as gifts or sell them. I add a small cake of soap to them and then tie the lot with a ribbon. Then it’s up to the recipient as to how they use them. So definitely bring on more crocheted dish/washcloths!